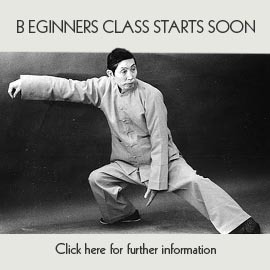 Form is very important in developing all aspects of Tai Chi and can encompass all the teachings of Tai Chi. Qigong has specific function towards both health and developing the internal for mind, body and even spirit too. However Standing postures can produce a love/hate relationship in as much as they can be demanding yet require no real movement externally and really does ask a lot of the internal workings as well as the mind. In every posture of the form the requirement is to learn the physical shapes and order of postures so we can string them along into an elongated set of movements as practice to make the body healthier and stronger and also to examine the internal function to help us understand the function of postures (again for health but also for martial application). However the principle of internal : rooting in the feet; directing the force up the legs to the base of the spine; ascending the spine and separating between the shoulder so as to direct the whole body force out the arms to discharge through the hands, is exactly the same for Standing postures too. The single exception is that one is done with the application of external movement and the other is done with the application of internal movement. The effects of Standing postures at first may seem small and time consuming by just standing there apparently doing nothing however the results of it are to unblock the stagnation and closed body habits of posture so the whole body force can consistently flow freely and unobstructed. Standing postures may be seen in this way as a foundation to the form, and a good method to return the body back to its original open state maybe after injuries or illness. This aspect shows that standing postures are a powerful yet simple Qigong exercise to aid health. In Traditional Chinese Medicine the simple idea is that good robust health is obtained by balancing all systems in the body by maintaining a smooth and consistent even flow of whole body force. This same condition is what we employ every time we do form or partner work, so again it is the foundation of all of Tai Chi. One of Yang Cheng-fu’s 10 essential points of Tai Chi is “Stillness within movement and movement within stillness” which is explicit in terms of Standing postures in that the external is still whilst the internal beavers away unblocking stagnation and allowing the infrastructure of our body to adjust and improve. The quote also is referring to whilst the external is moving we should have no tension but an even flow which is devoid of dense strength from the muscles thus creating internal stillness. The same movements that occur in standing postures occur in all form work too. This is why the form is considered a high level and complex qigong in its self. Therefore good practice is when we relate to different modes of exercise within the Tai Chi portfolio, we can carry the same thread of practice through them all and gain overall benefits which are the same (despite some exercises being stylised towards specific purposes e’g’ health, martial art, meditation etc). When we see some exercises of Tai Chi practice less favourable than others we are in effect denying all of the components of Tai Chi as they all lead to the same goal. Standing postures are simple in practice but demanding in patience usually because the muscles wear out quickly and start to ache. This is only a phase as the body recognises stagnation in the muscles and old habits in posture and seeks to correct them with alignment and opening the joints of the body. When the walls of obstruction gradually wear away and crumble the effects of standing posture and their practice can be quite powerful and satisfying. The results of them can be immediately injected into our form work to speed up our development. If you find yourself standing in a queue for a period of time always try to employ the principles of relaxing the whole body, “stretching out the bones” more commonly known as not allowing the joint to close tight, and sinking the heavy down in the body to allow the light to rise up. Externally it looks like nothing is happening but if you can stand it you’ll find a whole world of curiosity waiting to be discovered inside.